NB How much does this book match my blog!!! What a great book! Ihad this in my book stash and again, one of those books I had never got further than just flicking through looking at the pictures. This book is extremely picture heavy which makes it a proper treasure trove of inspiration. The book is split into ‘Embroidery basics’ and ‘Motifs and surface designs’. The Embroidery basics runs through both industry and home sewing and has a really nice way of showing the different stitches, techniques and materials with examples from textiles or sampler style embroideries. There are a lot of stitches made on paper which is a nice way to see the different styles clearly and is an idea for sampling in the future. The Motifs and surface designs actually does run through making up patterns and the various permutations of putting motifs together, but really explores design concepts and inspirations taken from nature. Theres a whole ream of inspiration photos and their resulting textile designs – each exploring different techniques, plus more images to gain inspiration from for yourself. 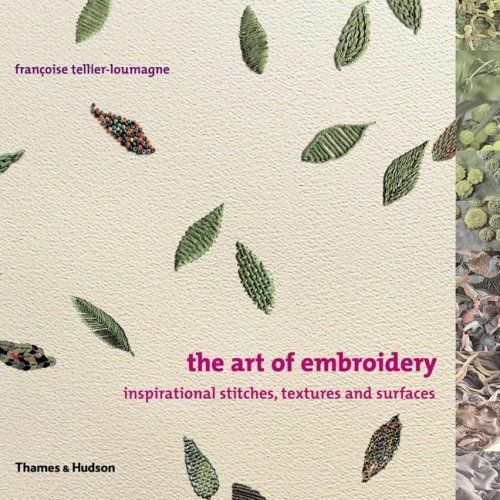 This is one of those books you get upset when you’re reaching the end – bring on the art of embroidery 2, 3, 4 and 17! I wish!